Traders can trade across four categories of assets which are forex currency pairs, indices, stocks, and commodities. You can select from 100 assets including 32 forex currency pairs, 22 market indices, 11 commodities, and 45 stocks of popular global companies. The OptionsClick website is offered in in six languages, namely, English, German, French, Arabic, Italian, and Russian. This broker provides a FAQs section on the website and customers can also contact the support department 24/7 to resolve their queries. Support is offered via phone, email, and live chat, and toll free numbers available are offered in the UK, Italy, and France. OptionsClick also offers a useful Trading Academy that can be used an online education center. It contains video tutorials in multiple languages and a helpful e-book that can be used as a mobile app on smart devices. Customers can use these resources to learn advanced trading skills. OptionsClick offers 24/7 customer support. It is crucial to keep in mind that virtually no service in the Binary Options Brokers category is an ideal solution able to meet all the requirements of different investors. It may be a good idea to read a few OptionsClick reviews first as specific solutions may actually perform well only in a specific geography or situation or be prepared with a very specific customer in mind. Others can function with a goal of being easy and intuitive and consequently lack complex features welcomed by more experienced users. You can also come across services that cater to a wide group of users and offer a complex feature toolbox, but that frequently comes at a higher price of such a solution. Be certain that you're aware of your needs so that you get a service that offers specifically the features you look for. We realize that when you make a decision to buy Binary Options Brokers it’s important not only to see how experts evaluate it in their reviews, but also to find out if the real people and companies that buy it are actually satisfied with the product. That’s why we’ve created our behavior-based Customer Satisfaction Algorithm™ that gathers customer reviews, comments and OptionsClick reviews across a wide range of social media sites. The data is then presented in an easy to digest form showing how many people had positive and negative experience with OptionsClick. With that information at hand you should be equipped to make an informed buying decision that you won’t regret. What Bonus Does OptionsClick Offer? 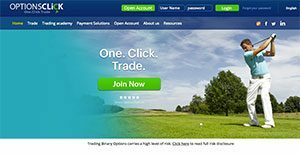 This broker also offers a lucrative “Bring a Friend” promotional program that gives a cash bonus to account holders who refer their friends and convince them to open a trading account with OptionsClick. OptionsClick is regulated by the the Cyprus Securities Exchange Commission (CYSEC), which is a huge plus for traders as this provides them with legal coverage should anything go south. Being a broker regulated by the CYSEC gives traders confidence and peace of mind since binary options trading is largely an unregulated side of the trading industry. Aside from that, OptionsClick is also a member of the Investor Compensation Fund scheme, which offers traders significant financial help should the broker fail to meet their obligations.